Indian Motorcycle, America’s first motorcycle company, today announced a comprehensive Daytona Bike Week experience that includes a custom bagger showcase, demo rides for all new 2017 models and a 2017 Chieftain sweepstakes. 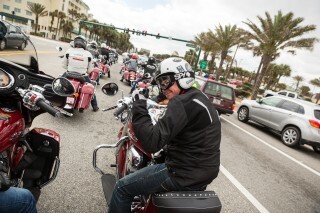 From Carey Hart’s custom Chieftain bagger on Main Street to the all-new Roadmaster Classic at the Speedway, Indian Motorcycle will have a presence throughout Daytona for all Bike Week-goers to enjoy. In addition, Indian’s new “Wrecking Crew,” backed by Allstate Motorcycle Insurance and featuring one of the most stacked lineups in flat track racing history, will make its debut at the American Flat Track season opener at Daytona International Speedway on Thursday, March 16. The team includes 2016 Champion Bryan Smith, along with two of the sports most decorated riders, Brad Baker and Jared Mees. The team will be armed with Indian’s Scout FTR750 for what is certain to be an unforgettable season. See what’s new from Indian Motorcycle at the Main Street display and enter to win a 2017 Chieftain. The two Indian dealers who recorded the most votes for their custom Chieftain bagger during a two-week ‘Project Chieftain’ voting period will be proudly displayed on Main Street during Bike Week alongside Carey Hart’s custom Chieftain build. Additionally, Bike Week attendees will have the chance to ride the entire 2017 line-up of Indian motorcycles, including the Indian Scout, Indian Chieftain, Indian Roadmaster Classic, among others. Ride multiple bikes, compare, and decide which Indian Motorcycle models best suit your riding style. Demo rides are free and available to those with a valid motorcycle endorsement and proper attire. Flat Track Opening Ceremony festivities commence at 6pm on Thursday, March 16, celebrating Indian Motorcycle’s return to Flat Track for the 2017 AMA Season. Celebrate Indian Motorcycle’s return to AMA Flat Track at the inaugural race of the 2017 season and root for the all-new Indian Wrecking Crew race team, comprised of three of the most successful and decorated flat track riders in the sport, including 2016 Grand National Champion Bryan Smith, 2013 Grand National Champion Brad Baker, and three-time Grand National Champion Jared Mees. The inaugural race of the season takes place Saturday, March 16 at 6 p.m.
Open daily, visit the dealership in the heart of Daytona Beach to check out Indian’s full 2017 line-up. At this exclusive location, Indian owners can retrieve a limited edition Indian Motorcycle race-inspired patch to commemorate their 2017 Bike Week experience. Indian wrapped trailers will be traveling to highly populated locations throughout Daytona and offering demo rides for select models from the 2017 lineup throughout the duration of Bike Week. In partnership with Daytona Taproom, Indian Motorcycle will be “taking over” and serving-up cold beer and three Indian Motorcycle-inspired specialty burgers. Destination Daytona at Klock Werkz Kustom Cycles Alongside Brian Klock and Klock Werkz Kustom Cycles, Indian Motorcycle will display various Chieftain models throughout the duration of Bike Week. Join us Thursday, March 16 from 10 a.m. to 1 p.m. for a behind-the-scenes tour of the Daytona International Speedway including the track, pits and paddock. After that, you’ll have a private meet and greet with the 2017 Indian Wrecking Crew Race Team – “Flyin” Bryan Smith, Brad “The Bullet” Baker and Jared “Jammer” Mees. Then, you’ll get a close look at the all-new Indian FTR750 race bike the Wrecking Crew will compete on. Visit the Events section on www.IndianMotorcycle.com for registration details.